2.Weatherproof & UV Protection - Weather-resistant materials and UV protection helps this furniture gracefully withstand rain, snow and glaring sunlight to provide long-lasting beauty. 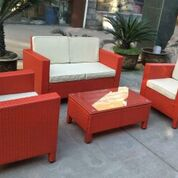 3.Strong steel Frame & Tigthtly PE Rattan Wicker - Built to last,With Gently Slopping Curves And Soft Yet Supportive Cushioning. 4.Comfortable Cushion -These Cushioned Seats is extra thick for added softness, and they Will Let You And Your Guests To Sit Back, Relax And Enjoy The Great Outdoors. 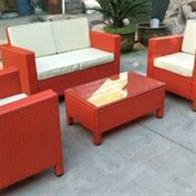 7.The Seat Cushions Are Designed To Resist The Elements And Stay Beautiful Through Years Of Use.